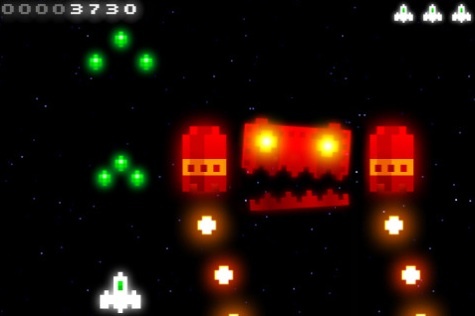 Repel an alien invasion in this Space Invaders inspired shooter. Radiant is a Space Invaders knockoff that not only features aliens from Namco Bandai's classic shooter, but also ghosts that look an awful lot like the ones from Pac-Man. The designers separate their game from the ones they imitated with slick neon graphics, a series of upgradeable weapons and some neat boss characters, making this iPhone App worth playing and the sincerest form of flattery. In the game, you play a pilot flying through deep space who also happens to be mankind's only hope. 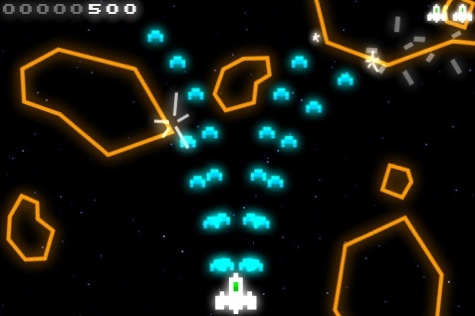 Standing in your way is an army of multi-colored aliens and asteroids that can vaporize your ship within seconds. What's cool about this game, one of several things, is that the ship auto fires, leaving you to worry about moving the spaceship left and right, achieved by tapping those respective directions on the iPhone's touch screen. In addition, destroyed enemies will occasionally drop money that'll help improve your arsenal, transforming an average laser into a rapid-fire weapon of mass destruction; there are six upgradeable weapons. In short doses, Radiant's quite enjoyable. Enemies swarm the playfield, purchasing weapon enhancements gives you an edge in battle, the slick looking visuals look great stretched across the iPhone's screen and we like the banter between your character, his/her superior and the alien invaders. All told, it's a fun shooting experience worth its ninety-nine cent price tag. At the same time, it quickly grows repetitive. The developers don't give you enough opportunities to upgrade, as you must fight your way through unspecified numbers of bad guys before spending some hard-earned cash. Thankfully, the game has infinite continues and will automatically save your progress, should you receive a phone call or need a break. It's far from being the most intense shooter on the iPhone, but Radiant's worth a look, if for nothing else than to max out all of the weapons and get your shooting fix. Check it out. What's Hot: Hot neon graphics, six upgradeable weapons, infinite continues, game automatically saves your progress, over 60 levels, Space Invaders and Pac-Man inspired enemies, three difficulty levels. What's Not: Shooting quickly grows repetitive, no way of knowing how many waves you must destroy before upgrading.